A 12-in. 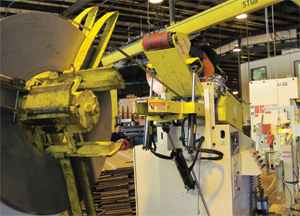 alligator-style peeler feeds Hickory Springs’ new 110-ton press, to allow for hands-free threading of particularly thick material. The two-axis peeler table has a telescoping peeler blade to reach the leading edge of the coil, and an upper dekinker table that includes a motorized threading roll. During threading, the leading coil edge is pinched between the roll and the peeler table, and then the peeler table lowers to dekink the material. time of said equipment. Such is the case at the Ft. Smith, AR, metalforming plant operated by furniture-component manufacturer Hickory Springs, which recently installed a trio of new coil-fed Aida press lines. Why invest in new press capacity now, in light of the economy? Certainly not to manage increased orders from the parent company, which continues to face increased competition from offshore suppliers. Instead, the significant addition of press capacity (110-, 200- and 600-ton Aida presses) to the facility aims to set the shop up as a contract stamper, as it looks to grow outside from its parent. And, from the beginning of its journey back in 2006, plant management has had its sights aimed in the right direction. Also critical to its successful implementation of the new lines was a new 12-in. alligator-style peeler that feeds the 110-ton press, to allow for hands-free threading of particularly thick material. Supplied by Coe Press Equipment, Sterling Heights, MI, which modeled the device after similar technology developed several years ago for its large-capacity machines, the new peeler-dekinker provides hands-free motorized threading capability for users of small and mid-sized straighteners. “It allows us to thread up a new coil of that heavy stock in less than 5 min.,” says Williams. Coe Press also supplied (along with its distributor partner Stafford Machinery Co., Little Rock, AR) identical, more conventional feed lines for the 200- and 600-ton lines that include servo feeds, straighteners, threading reels, and 10,000- and 20,000-lb.-capacity coil cars, respectively. The servo feeds mount to the press and pull material out of a free slack loop. A 42-in. line mounts to the 600-ton press, a 36-in. line to the 200-ton press. Stafford also installed Wintriss SmartPac 2 controls to each new line, with the Wintriss Lets Line Efficiency Tracking Software. Coe Press supplied identical, conventional feed lines for the 200- and 600-ton presses, which include a servo feed mounted to each press as well as a straightener, threading reel and 20,000-lb.-capacity coil car. A 42-in. line mounts to the 600-ton press, a 36-in. line to the 200-ton press. furniture and eventually became one of the largest manufacturers of motion mechanisms for furniture items such as recliners and sleep-sofas. It also operates an automotive-supply group (Hickory Springs Automotive) and a tube-mill division. Core competencies in metalforming include fourslide and clip stamping, and when the market for its core products dropped off beginning in the early 2000s, the firm looked to capitalize on its metalforming expertise to expand into new markets. “Beginning in 2006, we set out to diversify to where at least 20 percent of our work would be outside the furniture industry,” says Williams, describing the goal of managers at the Ft. Smith plant, one of only two metalforming shops serving Hickory Springs, which operates 55 plants in all. “Immediately taking advantage of the customer base from our tube mill, we were able to quickly add some of those customers to our stamping-customer list and provide them with parts as well as value-added assemblies. Contract stamping now accounts for some 80 percent of our production—we’re manufacturing components for the RV and automotive industries, as well as for retail stores,” adds Williams. The big job in that lot has been stamping and welding automotive subassemblies (for one of the company’s tube-mill customers), a project that launched in February 2010. “Some of the dies for this program measure 12 ft. long,” says manufacturing engineer Tim Wells, “which filled up the biggest press we had when we first bid on the project. So, we went looking for a new press to handle those dies and that allow us to work with even larger dies. 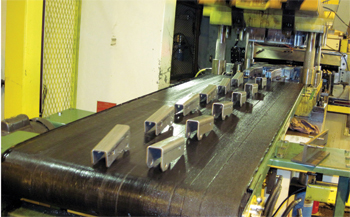 The plant’s new 200-ton press line runs some of the smaller dies needed for its automotive-assembly program, such as the stamped brackets shown exiting here from a two-out die that runs at 50 strokes/min. The three fully equipped press lines joined the 32,000-sq.-ft. pressroom in January 2009—overall, the plant offers 180,000 sq. ft. of floor space, including a 20,000-sq.ft. fabrication shop. The 600-ton model, a straightside press, was carefully specified by Wells after evaluating the larger dies—weighing as much as 26,000 lb.—used to stamp automotive parts. “I evaluated the point in the stroke where the parts would start to draw,” Wells says, and calculated the energy required, comparing the calculations to the press-energy curves from Aida. Stamping automotive parts, the 600-ton press processes five different dies on a regular basis, with typical part quantities of 10,000; it takes two weeks to complete the cycle. Smaller parts run on the new 200-ton press, a gap-frame model, at about 50 strokes/min. 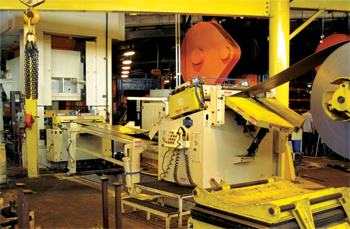 One of the critical success factors to operating high-volume high-speed press lines for contract stampers is quick changeover, and Wells and his team promptly attacked that operational area. The two-axis peeler table has a telescoping peeler blade to reach the leading edge of the coil; tapered ends facilitate threading of wide as well as narrow coils. Meanwhile, the upper dekinker table includes a motorized threading roll—during threading, the leading coil edge is pinched between this roll and the peeler table, and then the peeler table lowers to dekink the material. “We like the unit so much that we expect to purchase one for the new 200-ton line as well,” says Wells. With coil changes down to less than 10 min., Wells and his team aren’t done fine tuning the process to yield additional press run time. He expects to be able to cut coil-change time in half, by enhancing some of the pressroom’s practices and procedures.